The goals for the redesign of the EMC site were to promote the company’s custom engineering services including design, product management and testing capabilities. In addition, EMC wanted to highlight successful past projects by adding press releases, articles, and case studies. Other site improvements involved adding interactive elements to facilitate contact between EMC staff and potential customers. Finally, EMS wanted to explore utilizing social media sites including Facebook and Twitter to promote their services and expertise. 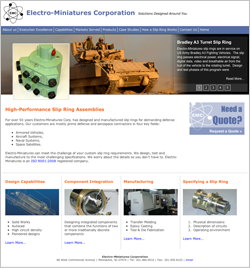 ACI redesigned the EMC website by creating a professional, user-friendly layout that highlighted the custom built products and engineering expertise offered at Electro-Miniatures Corporation. In addition to the new look and feel, ACI created an email-based contact form, a Flash-based photo gallery and a user-friendly navigation architecture so information was quick and easy to locate. Finally, ACI implemented a new Facebook business page and Twitter account for Electro-Miniatures.